Convert your Jpg, Png, Gif, BMP file and scanned PDF to TXT and DOC! The conversion to Text service is in maintenance. 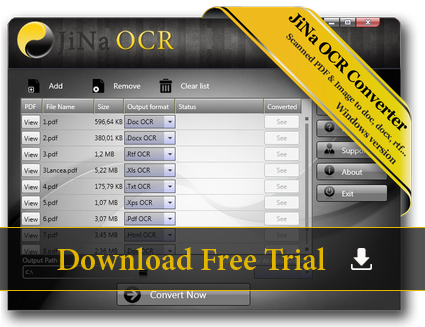 If you want to convert your scanned image or PDF to Word Docx/Doc file you can use JiNa OCR Online Converter. You can also use this online tool to convert your PDF into DOCX. Convert Scanned file jpg, png or Scanned PDF into Word doc and Text! To Convert you need simply to upload your image or PDF file and click on "Convert and Download" button, you will be able in a few seconds to download the converted Text file by clicking on "Download" button. Important : All uploaded files are automatically deleted just after the conversion process. 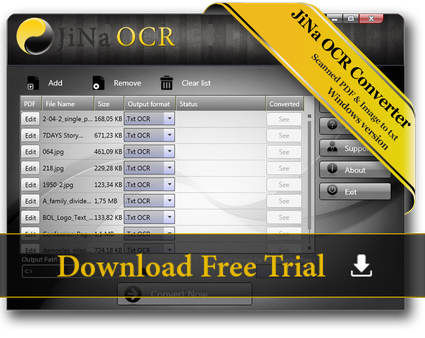 JiNa OCR Image and PDF to DOC & DOCX Converter for Windows! With this version you will convert image and PDF files to Word docx, doc, rtf, txt and more! You can also convert to Excel xls format! Now it is possible to convert any sanned image into editable text file with our new software JiNa OCR Image To Text. Dedicated for windows desktop, this software is very easy to use, you need just to upload your image file and click on the button to convert it directly as the online version below. With this new desktop version you can also upload and convert many images files in one click, no need to convert them one per one, you can select more than one image and click directly on the button to convert them.